New items are higher quality than gently used items. Are they really? Every time I shop at my local Goodwill shop, I find expensive designer items for a fraction of the cost – and they have no holes, stains or apparent wear and tear. So why do we feel the pressure to buy new when we can get what we want used if we are patient? Plus, in the process, we teach our children to reuse, repurpose and recycle gently used items. We humans — particularly Americans — are stressing our planet to the point of global warming. Help your child understand these valuable concepts by shopping together at used stores to teach them how to reduce their carbon footprint. 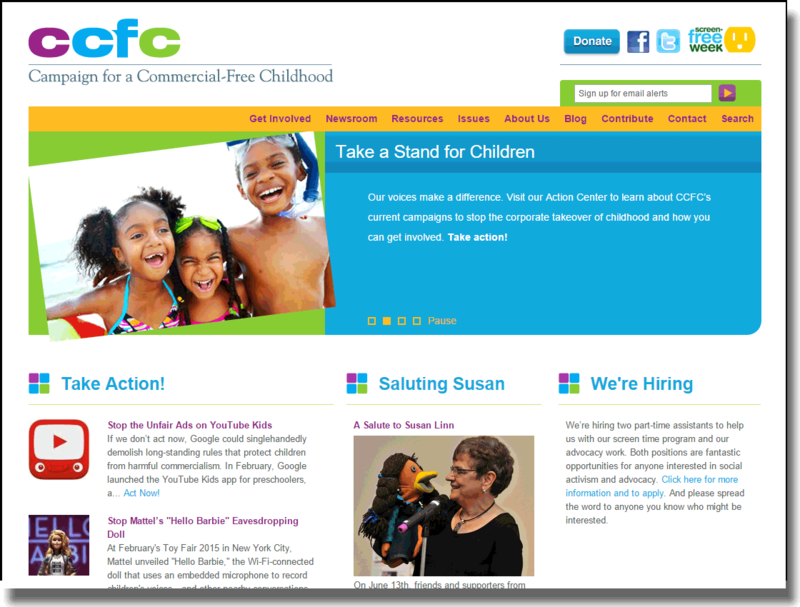 One of my favorite resources to support the goal to protect your child’s innocence and ideas to help your children navigate the mixed and sexual messages of the world is the “Campaign for a Commercial-Free Childhood,” or ccfc.com. The site will provide you with many challenges to assumptions about parenting that you take for granted. The Campaign for a Commercial-Free Childhood website is a powerful tool that empowers parents to stand up for “Innocence” and to educate their children accordingly. The “Resources” section contains useful and helpful information that gives parents a lot of food for thought about how they are raising their children in this media- and sales-driven society. The organization asks its followers to take action by contacting manufacturers who create and market products that over-emphasize technology or market to children. For example, as of Dec. 28, they are asking parents to contact Fisher Price regarding the Apple® iPad™ bouncy seat for infants, shut down happymeal.com and ask corporations to stop making false claims regarding apps for babies. Each year, the CCFC invites parents and educators to vote for the worst toy in terms of its impact on children and childhood. The most negative toy of the year earns the TOADY (Toys Oppressive And Destructive to Young children) award, which is not a good publicity statement for the brand. In 2013, the TOADY went to the iPotty by CTA Digital. The award for 2012 went to the Fisher Price Laugh & Learn Apptivity Monkey. Coming in May, the organization is asking parents and their children to turn off all devices during the “Device Free” campaign week to encourage discussion, personal interaction, imagination and active play. Because of the many resources, it is a great site to consult when deciding which technological toys and devices are right for your child and when. The best rule of thumb for parents to keep in mind is whether the device is a necessity and how the device will negatively impact emotional, social and/or physical development.